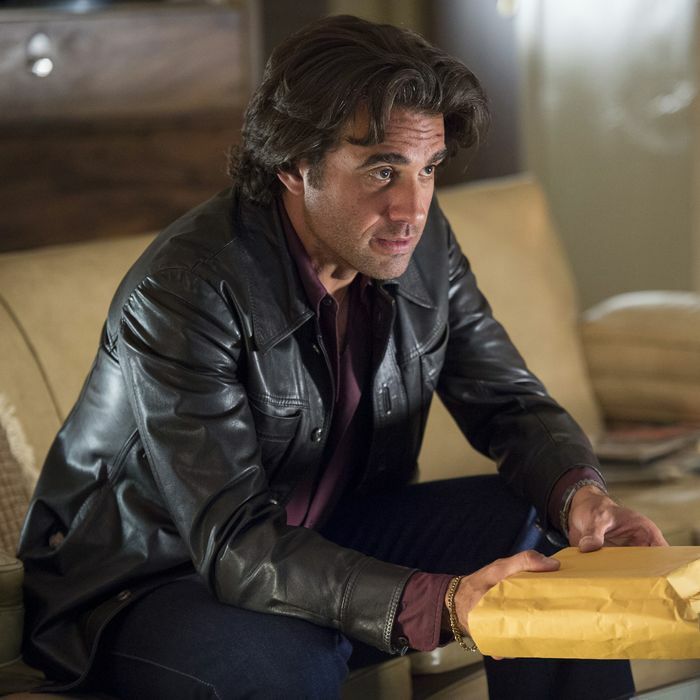 After its two-hour pilot burst with possibility and the second episode doubled up on the worst elements of its premise, Vinyl settles down this week, establishing how it might set itself apart from every other prestige drama on cable. Plenty of shows tell stories about rich, middle-aged white dudes trying to recapture their relevance in rapidly changing cultures. But how many feature cameos by actors pretending to be the Raspberries, England Dan, and John Ford Coley? Surely, some viewers will never be able to look past the goofiness of a TV series where Alice Cooper (played by Dustin Ingram) and Johnny Thunders (Jaster Leon) pop up for a scene or two — with speaking parts and everything. But I’ll say this much for Vinyl’s third episode: It doesn’t integrate real-life rockers with timidity. When Alice Cooper shows up, by God, he gets an entire subplot. The Cooper thread is one of about five major story lines in “Whispered Secrets,” and also offers the first substantial work for Jack Quaid (son of Dennis Quaid and Meg Ryan), who had a few lines as young A&R stud Clark Morelle in the first two episodes. Here, Quaid gets a good ten minutes of screen time, as Clark gets the runaround while trying to sign Alice as a solo artist. This episode also continues two ongoing arcs: Jamie’s frustrated efforts to get Julie to see what’s special about the Nasty Bits; and the saga of Lester Grimes, following up on last week’s episode-ending moment when Richie showed up at Lester’s door, carrying a package of old blues demo tapes that he wants to release. However, the two most substantial story lines are Richie-related — or at least Richie-adjacent. In one, Devon is stunned to learn that her husband turned down Polygram’s multi-million-dollar buyout of American Century, which forces her to auction off an Andy Warhol portrait of herself to meet financial commitments to a dance troupe she supports. In the other, Richie’s efforts to revitalize his label hit a snag when his past dealings with organized crime remind him that he has obligations beyond his muse. Like “Yesterday Once More,” “Whispered Secrets” strikes some clunker notes. Though Devon’s subplot inspires one of this episode’s best scenes — more on that in a moment — it arrives after an excruciatingly long, clichéd domestic dispute in the Finestra household. Richie has stupidly kept secrets, and Devon rightfully feels betrayed, but as they scream at each other about past plans and promises, it feels like the Vinyl writers have cribbed lines from every generic TV marital spat they’ve ever seen. The fight even ends with a cute kid standing in the doorway, effectively shaming her parents into shutting up. That bit had hair on it in 1973. On the other hand, this episode does get back to the snappy patter around the American Century offices, which the pilot did so well. Clark’s story line is the only one that’s overtly comic, as Alice Cooper runs him ragged — and keeps spraying him with different kinds of fluid over the course of their 24 hours together. Overall, though, “Whispered Secrets” is looser and funnier than “Yesterday Once More.” If Vinyl has nothing else to offer, it can always fall back on scenes like the one where Richie tries to get his marketing man to invent a futuristic-sounding name for their new sub-label (“Atomic?” “I mean the future starting today, not 1942”), or the one where the gang tries to decide if they should get a singing nun to record a Christmas album (“Christmas is supposed to be happy. A nun? Too religious”). “Whispered Secrets” also has a nifty visual bookend, as Richie starts the episode shaken up by the empty chair at an industry event that was supposed to be filled by the late Buck Rogers, and he ends the episode staring at the blank space on his bedroom wall where Devon’s Warhol used to be. Just a few days into Richie’s big reinvention campaign, there’s already been a lot of loss. The episode’s other major theme involves signatures, from the Warhol name that will make Devon’s portrait valuable to Jamie urging the Nasty Bits to retreat to their old sound. “They don’t sound like them,” she grumbles to Julie. It’s too early to say whether Vinyl has a signature, although its willingness to shoehorn real pop history into a piece of fiction is definitely bold. The show risks something each time these characters cross paths with a Robert Plant or a Kool Herc — if only because some segment of the audience is bound to cringe at the actors’ impersonation and the writers’ interpretation. Over the series’ run, that approach to the past may matter in big, broad ways. For now, though, at least nobody who flips past Vinyl on a Sunday night will mistake it for anything else. Ken Marino pops up at the start of the episode as Jackie Jervis, a record executive who roasts his colleagues — and in the process, reveals to Devon that Richie didn’t follow through on the Polygram deal. Jackie’s monologue is a gift to those of us who watch Vinyl to spend time with the music industry power-brokers of the early 1970s. We get brief glimpses of actors playing Berry Gordy, Jerry Wexler, and Casablanca’s Neil Bogart, the latter of whom is so colorful that he deserves a TV show or biopic of his own. (Justin Timberlake signed on to star in a Bogart movie in 2013, but nothing’s become of it yet.) Jervis may be loosely based on Joe Smith, a former DJ who became an A&R man and then a label boss, and who was often called on to emcee industry functions — where he’d mercilessly mock his peers. Alice Cooper tells Clark that he’s in New York to work on a project with Todd Rundgren. I couldn’t find any evidence that the two had ever done anything together in 1973, though Rundgren did produce Cooper’s contributions to the Roadie soundtrack in 1980. Also, before the band became “Alice Cooper,” they were Nazz — until they found out that there was already a Philadelphia act with that name, led by one Todd Rundgren. Alice dismisses the idea of signing with American Century because, when the band was first starting out, Richie wasted their time. But the suggestion of becoming a solo act must not have offended him too much, because in the real 1973, Cooper was about a year away from doing just that. To my ears, the “raw” original song that the Nasty Bits play at their gig wasn’t any less polished than their Kinks cover. Making that band sound like a credible 1973 proto-punk act is going to be one of Vinyl’s biggest ongoing challenges. Along those same lines, I’ve been unable to find any record of any early ‘70s bands named “Hannibal” or “Indigo” — or at least not ones major enough to be a topic of conversation around a big record label’s offices. So I’m pretty sure the writers are just sprinkling in those names now to generate some credibility for when the bands show up later. Terence Winter did this all the time on Boardwalk Empire, to the extent that he’d even have an actor like Dominic Chianese just stand silently in the back of a scene, weeks before his character got his first line. Anyway, we know from the discussion of Indigo that they’re an R&B group, who will likely represent Vinyl’s take on the emerging disco revolution. And Hannibal? Hmmm … maybe prog?